← Vote for Protagonize at the PopVox Awards! Well, as you may have noticed by watching the site over the last few days, I’m back from my week-long holiday in Hawaii and I’ve been busy getting the site updated with a bunch of new features. What new features might these be, you ask? Yes, I’ve added a new comments aggregator page, improved commenting in that you can now read merged conversations with all authors (for profile-to-profile comments), and I’ve added a little navigation tool to help users jump back to any previous branch or chapter in the story they’re currently reading. Watch the blog for more info about these changes over the next day or two! This last two-week stint has been quite eventful, aside from site updates. Protagonize is up for a PopVox Award, made the cut for round 2 of the 2008 New Ventures BC Competition, and last but not least, we cracked the 1,500 author milestone yesterday! At last check, we’re sitting at around 1,530 registered authors. Keep those stories coming, folks. 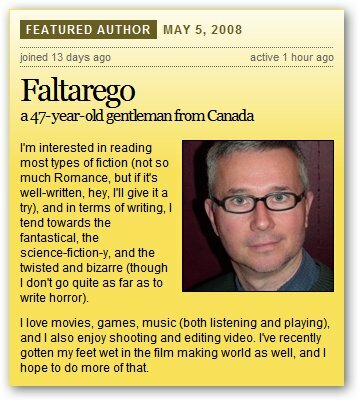 This week’s featured author is Falterego, a 47-year-old gentleman based in Canada. Falterego has posted one stories and 6 branches or chapters since joining the site less than two weeks ago. In addition to posting 31 comments, he currently has an amazing 4.93 average rating based on 27 ratings from other readers on the site, good for top spot as of tonight. Nicely done! Falterego‘s single story, “The Unseen Way“, has generated a metric ton of interest thus far, garnering 32 comments, several favourites and markers, and an average rating of 4.65. You can check out Falterego‘s profile here. Last week’s featured author was JJ1979, a 28-year-old English literature teacher (and boxer!) joining us from the United Kingdom. JJ1979 has been prolific since joining the site only 12 days ago, having posted five stories, seven branches or chapters, and receiving an average rating from other Protagonists of 4.42, based on 24 votes. JJ1979‘s profile is available for your viewing pleasure right here. This week’s Editor’s Pick is “Who chooses to forget“, a linear story by seldom, a relative newcomer to Protagonize. This appealing mystery has done quite well so far, with 6 chapters, 50 comments, and a solid 4.71 average rating based on 17 votes by our readers. “A parcel sat on the doorstep. Alice almost stepped on it, but caught herself in time, snatching back her foot and leaning heavily into the doorframe. The parcel was quite small, about the size of a child’s shoebox, and was wrapped in brown paper. She glanced briefly up and down the street and then lifted it up, turning it over to find the address. Nothing on it except her name in scribbly biro: A. Randall. Alice peered at the writing, but didn’t recognise it. You can read the rest of “Who chooses to forget” right here. Last week’s Editor’s Pick was another linear story, “A Glossary of Forgotten Species“, by another newcomer to the site, DrPinch. What differentiates this story from the pack was the interesting subject: an encyclopedia of forgotten species, from the future. Intriguing, and if you read through the 18 existing chapters and 99 (!) comments, a ton of fun. Make sure to check out “A Glossary of Forgotten Species” here. Well, that’s a wrap for this (bi-)weekly roundup. I’ll be back on my normal weekly pace for updates next week, but be sure to keep an eye on the blog for details about our new features later this week. This entry was posted in Awards & Recognition, Features, General, Site updates, weekly roundup and tagged comments, conversations, Editor's Picks, Features, nvbc, popvox, Press, roundup, weekly. Bookmark the permalink.